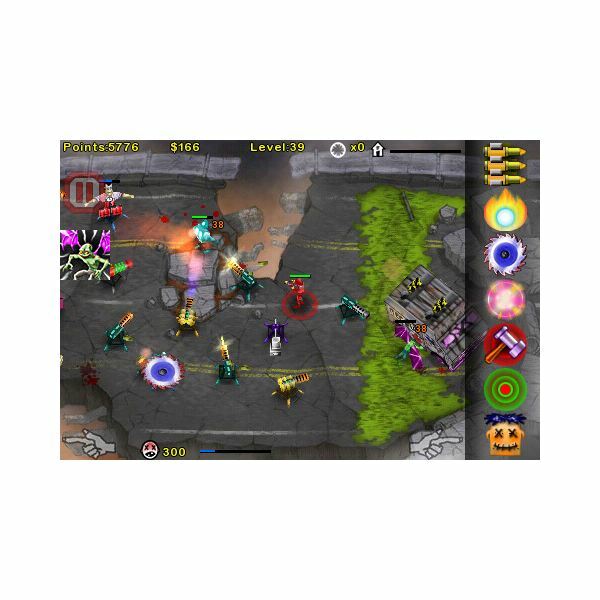 Zombie Attack was one of the very first iPhone tower defense games. Soon it became one of the most popular TD titles. With a very out-of-the-box concept, Zombie Attack provides a fresh new approach to the tower defense genre. Gameplay is far more superior to the first game, and has more turrets and zombies. The objective of Second Wave is to protect the building from the undead. You will have to help the survivor to place all turrets, and this means you will have to be careful not to become an easy prey. Just guide your survivor safely past the flesh-eating horde and position turrets to zap them before they infiltrate your building. One of the most fun parts of Zombie Attack is the unusual assortment of weapons. The second game of the series packs in more firepower with a bizarre list of scarecrows, giant hammers, flame throwers, saw blades, ray guns and other crazy stuff. The visuals are okay, but not that spectacular compared to other TD games on this list. However, every tower defense fan will go for gameplay and concept instead of graphics, and Zombie Attack: Second Defense is quite promising gameplay-wise. 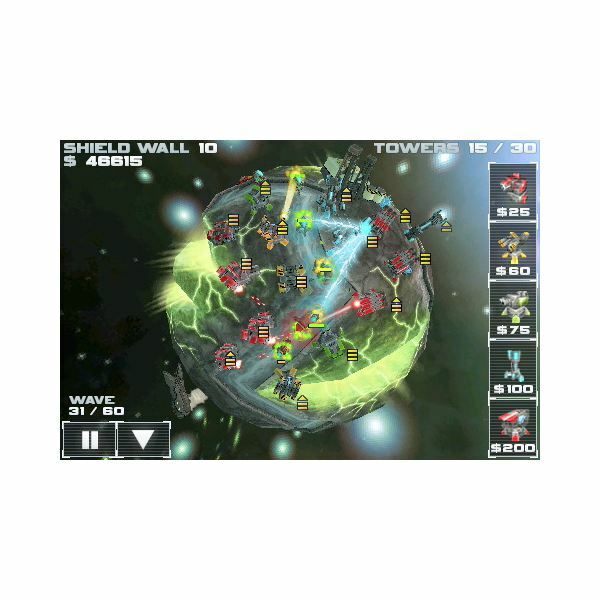 Star Defense is your typical fixed path TD game, but its unique 3D surroundings sets it apart from other tower defense games. You will have to place turrets on 3D spheres and cubes and will constantly have to monitor enemy infiltration by rotating the spheres using your fingers. You can pinch-zoom to have a clear view of enemies infiltrating your base, swipe the finger to move the camera and use standard iPhone finger gestures to rotate the 3D spheres. The futuristic setting complements with the game’s unique 3D view mode. Humans have colonized different planets and have to defend these planets from the S’Rath invaders. You will have to help them by placing towers along the fixed paths, kill invaders before they reach your planet’s shield wall and acquire credits to buy more towers and upgrades. There are 5 different tower types, including Neo Plasma Blasters, Phase Coils and cannons to zap and slow down enemy speed. Star Defense’s unique 3D visuals adds spice to the standard gameplay concept. The gorgeous 3D visuals make this game even more interesting and vibrant. However, it is not all visuals, but also some challenging levels that makes the game a little more interesting. The game’s advanced levels will take place on 3D cubes, where monitoring can be a bit difficult. Also, the enemy will attack in waves much more quickly. Star Defense is a solid TD game with a very unique visual style. 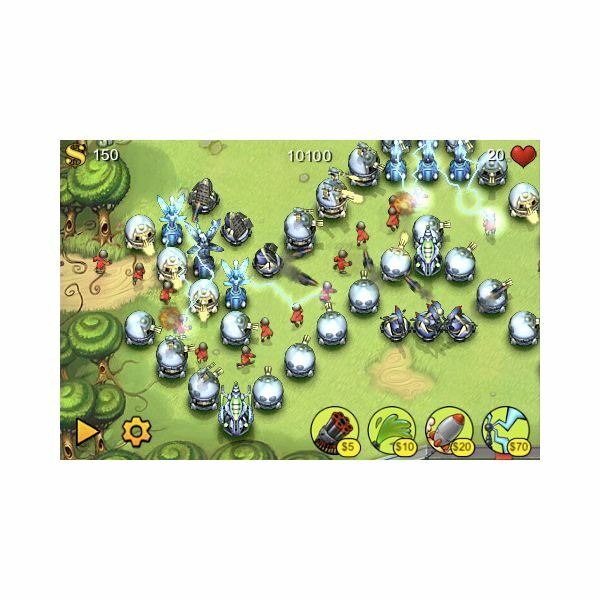 There are a few iPhone tower defense games inspired by popular games, movies and books. Middle Earth Defense is one such game which is based on LoTR. Everything, from dark locales to characters blends pretty well with the game. There are 18 challenging levels, and each level takes place in some exotic LoTR battle location, including Battle of the Helms Deep and Mines of Moria. In Middle Earth Defense, you have Lord of The Rings heroes of the fellowship as defenders instead of turrets and towers. You will position Gandalf, Arwen, and Aragorn and also deploy allies such as the Elven Archers and Riders of the Rohan and defend against the evil forces of Sauron. The best and the most challenging part is that the game does not follow a fixed path. Enemies will approach from all sides and you will have to position your troops strategically and build plenty of barricades to slow down waves of enemies. There are plenty of upgrades available and each upgrade can be earned by defeating enemies. There are also a host of achievements to be earned and characters to be unlocked. The 3-level difficulty setting will give you enough reasons to play the game over and over again. Visuals in Middle Earth Defense are splendid. The 3D backgrounds are well designed and will remind you of every locale you’ve seen in the movies. The characters, however, are slightly dull in design and look quite tiny against the large 3D background. Nonetheless, the game is a good attempt in combining the classic tower defense mechanic with LoTR characters. Geo Defense’s strength lies in its arcade-inspired visuals. The vector-style graphics will remind you of old-school arcades and Geometry Wars. Keeping the classic TD formula intact, Geo Defense follows the fixed path concept. Creeps attack in waves in a fixed path and to defend your base, you will have to place geometric vector turrets strategically. The turrets unleash devastation in the form of lasers, missiles and blasters and reduce creeps to a pile of pixilated dust. There are 5 tower types and each tower can be upgraded up to level 7. The game visuals are bright and the level design is excellent. The old-school retro visuals a la Space Invaders and Galaga will certainly make you nostalgic. The best part is that the game sticks to the classic tower defense genre and does not try to do something unusual. Geo Defense is well worth your time, and with the very low price tag, the game’s a must-have for all TD fans. 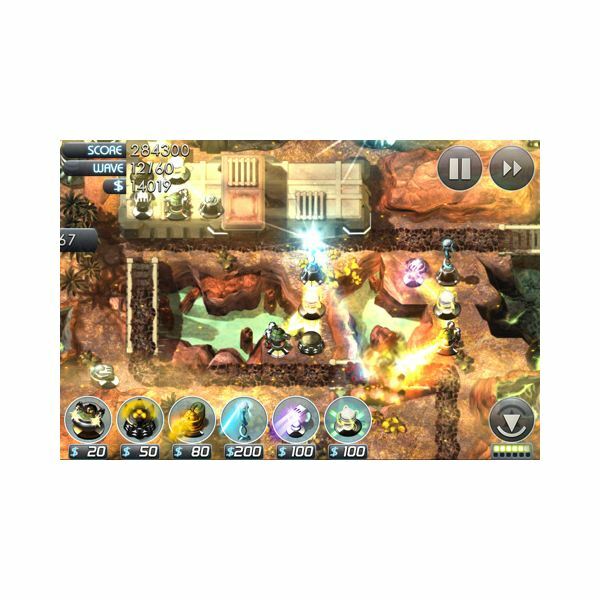 Fieldrunners is a bit more pricey than other iPhone tower defense games, but is fun and involves strategy and tactics. Instead of a fixed path tower defense, the game lets you create your own maze of turrets and prevent enemies from sneaking past through. You have 4 different types of towers to place, including lightning tower, goo tower, long-range missile tower and short-range Gatling turret. Of these the Goo tower is used to slow enemy speed and lightening tower is the most powerful defense, albeit a bit expensive. You can purchase and upgrade these towers using money or points earned by zapping down waves of enemies. Fieldrunners on iPhone makes good use of the phone's screen space. You can pan across the open field and pinch to zoom using your fingers. The towers can be easily placed in an open field and upgraded many times. The sound effects, visuals and controls are impressive. However, there are quite a few maps and it would be better if developers include more maps. Nonetheless, the game scores well in terms of replayability and good design and is highly recommended for all tower defense gamers. With colorful cutesy visuals and a unique plot, The Creeps adds a whole new level of depth to the standard TD formula. 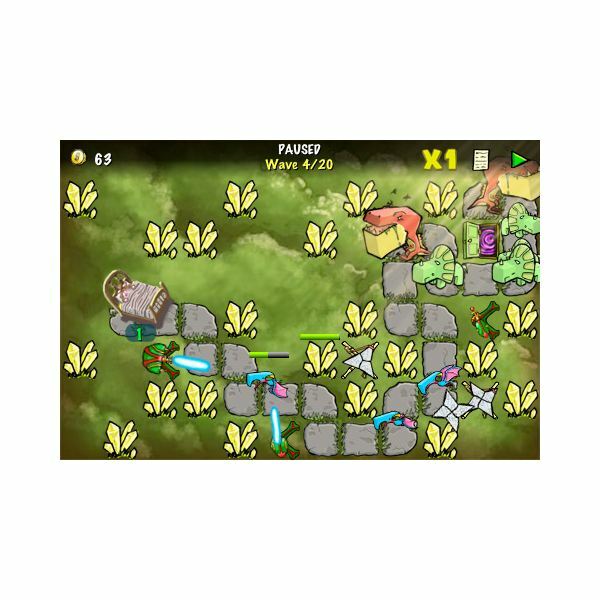 The fixed path gameplay is as challenging as any other tower defense title. The objective is to stop the nightmarish creeps from infiltrating the dreams of sleeping toddlers. You will have an arsenal of weapons to attack them, but the real challenge arises when objects like trees and gravestones come in between the creeps and turrets. Much time gets wasted in destroying these objects, allowing a creep or two to slip in and reach their target. You will have to be quick and clever enough to place towers in the right spot. As you progress through different levels, the game becomes tougher, allowing you to also use the accelerometer to position your turrets. The deceptively simple and cartoonish graphics does not mean the level of gameplay is simple. The Creeps is surprisingly difficult to play at later levels, throwing in more challenges than you can imagine. The new version packs in additional levels, including 22 Easter themed levels, 30 Dinosaur themed levels and 22 Valentine’s Day themed levels. Every level offers more fun than the previous level and will certainly keep you coming back for more. Homeworld’s gameplay can be summed up in three words – simple, addictive and immersive. In fact, the entire Sentinel series sets a new example of tactical tower defense. Without doing anything unusual, the developers have focused more on the gameplay and visuals. The game has a nice balance of tactics, action and challenging gameplay. The objective is the same; you will have to build a variety of turrets to protect your base against an alien attack. The game gets over if any one alien entity breaks through your turret defense and the protective barrier. You can build a variety of towers, such as bombers, missile launchers, laser turrets and place them tactically so that the enemy gets zapped before it reaches its target. Sentinel 3 also has a few RPG elements. You can upgrade your towers from the XP earned by killing aliens. The credits earned as well as power-ups can be used to customize your turrets and increase firepower. There are also a variety of unique commander abilities, including repair, jet and rage modes that ensure you have more freedom in eliminating incoming threats. You can also purchase powerful weapons and homing missiles from the credits earned. The slight inclination towards the RPG genre, makes the game quite immersive and gives you ample chances to invest in the right tower and destroy any attacking aliens. Sentinel 3: Homeworld has depth in gameplay and is one of the best iPhone tower defense games of all time. The TD genre has evolved into impressive strategy games with unique concepts and gameplay variations. Take the example of Plants vs. Zombies. It features the traditional tower defense formula, but instead of turrets and creeps, you have bizarre plants defending your house against menacing zombies. 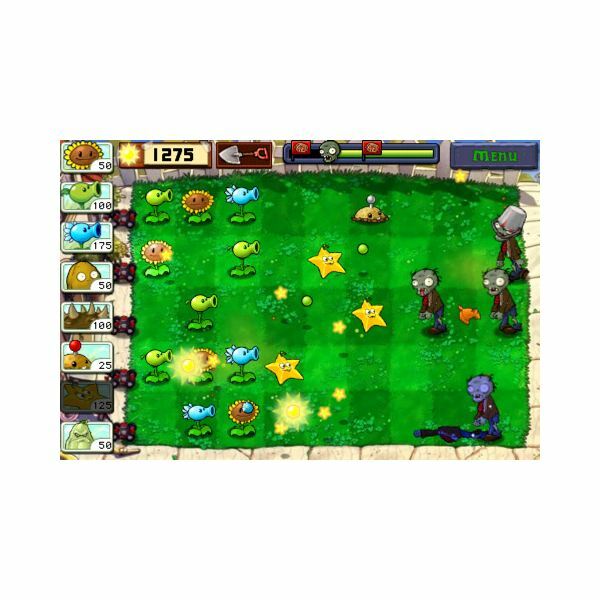 There are various types of defensive and offensive plants and all of them spawn by planting seeds on a grid-like yard, fending off an attack wave of zombies. The iPhone port of Plants vs. Zombies is as good as the PC version. The phone’s multi-touch screen lets you tap the seeds icon at the left side of the screen and then tap again on the grid to plant them. You can also drag-and-drop the seeds around the yard. 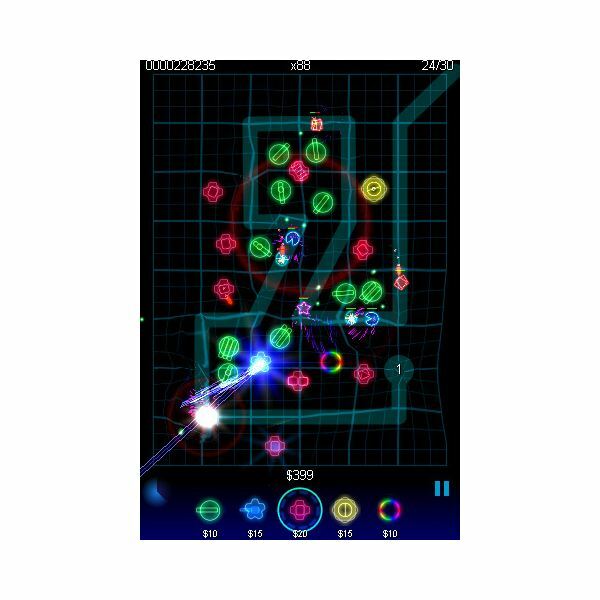 Although the iPhone screen estate is smaller than the PC, it is still easier to play this game because of the multi-touch interface and big icons. The developers have done a good job utilizing every part of the screen and providing a simple UI. The cartoonish visuals are well designed, offering plenty of laughs. The strange attire zombies wear to defend themselves from flesh-eating plants are hilarious. The iPhone port is a refreshing change to the standard TD games and is quite addictive as there are plenty of upgrades, challenges and game modes to keep you busy for hours. 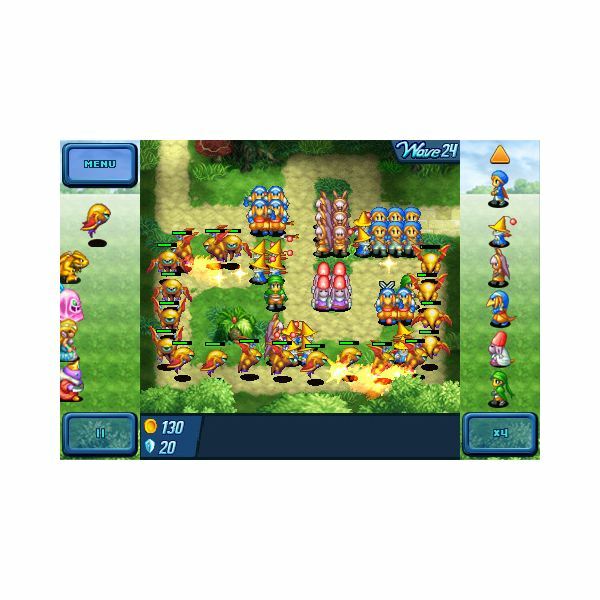 Crystal Defenders marries Final Fantasy (FF) tactics with the classic TD genre. The objective is to defend crystals from baddies by placing FF characters in a tactical map and defeating Final Fantasy villains like Malboro and Tonberry. It is very important to deploy your units tactically; else the baddies will sneak past your defense and steal your precious crystals. The game’s over once all crystals get stolen. Like Final Fantasy Tactics, Crystal Defenders has enough gameplay depth. There are three modes of gameplay, starting from the tutorial mode, which teaches newbie players all about tactics and unit placements. The second and third game modes are all about serious strategy and tactics and will explain the benefits of leveling and upgrading your FF heroes. Every game mode is playable and offers some excellent tactical maps. The controls in Crystal Defenders rely on the on-screen D-pad for movement. The rest of the controls, including selecting your characters and placing them on the right spot can be controlled directly. I would rather have a complete direct touch-screen support to pan and zoom in instead of having a separate D-pad button. However, there are no action controls in any TD game, except the usual drag-and-drop control and hence an additional D-pad will not be much of a problem in gameplay. Crystal Defenders' price is much higher than other iPhone tower defense games in this top 10 list, which is why some may think whether the game is worth the price. I recommend playing the trial version first and then purchasing the premium version in case you like the game. Remember that the game is developed by Square Enix and so there will be surprises and hours and hours of tactical fun and enough variations to get you glued to the iPhone screen. Combining RPG elements with the traditional Tower Defense gameplay concept, Defender Chronicles provides a tremendous amount of replayablity through varied challenging maps. The main goal is to defend the General Headquarters by positioning your very best defenders in the right spot. You will command a wide range of Heroes from warriors, to archers and berserkers. The enemy roster is also quite diverse and includes goblins, Gnolls, Slimeballs and Golems. A good set of Heroes and equally impressive villains makes every level quite well-balanced and engaging. The game's RPG elements revolve around upgrading your heroes based on the skill points and stars earned. The points earned during battle can be used to upgrade their defenses, attack powers and skills. There are 5 maps and 5 game modes, of which freestyle and classic are some of the best replayable modes. The game’s 4-level difficulty setting brings in more depth and challenge to the TD genre. With every difficulty setting, the enemy wave gets even more defiant and requires you to be quick enough to place your heroes and upgrade them to fend off any incoming attacks. The game visuals are quite impressive. The medieval fantasy look will remind of Heroes of Might and Magic. Instead of the traditional top-down view, the game follows the 2D side-scrolling view, which adds uniqueness to the genre. Some gamers might not be comfortable at first, but the tutorial mode will help them a lot. All in all, Defender Chronicles is a good game in terms of concept, design, visuals and gameplay.